The already intense 2018 Longines Global Champions Tour ranking battle could be in for a major shake up, as reigning LGCT title holder Harrie Smolders (NED) returns with top stallion Don VHP Z for what promises to be a thrilling Shanghai LGCT. Less than one week after Formula 1 hit town for the Chinese Grand Prix, fans will be treated to a very different display of horsepower as the world’s best athletes fly in to for a weekend of top sport. 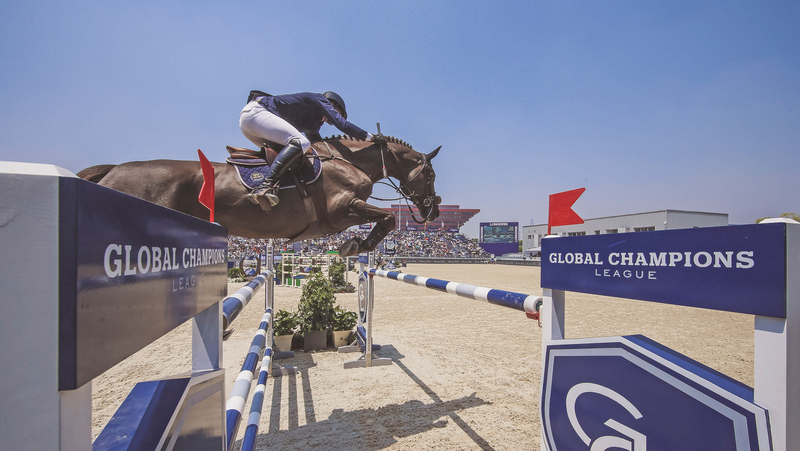 Both two-time LGCT Champions Scott Brash (GBR) and Edwina Tops-Alexander (AUS) will be back at the most Eastern destination on Tour, both hoping to keep their dream of a historic third win alive. Britain’s gold medallist Brash leads the charge in the overall ranking, with Tops-Alexander just 13 points behind – and with 40 points for a LGCT Grand Prix win there is everything to play for as the first part of the 2018 season unfolds. However this weekend could be a game-changer as reigning LGCT Champion Harrie Smolders (NED) makes his return to the Championship, with the in-form Dutchman bringing top stallion Don VHP Z as a clear sign of intent. Smolders won gold at the LGCT Grand Prix of Shanghai in 2015, and will be hungry to start his 2018 Championship charge – knowing every point will count in the fight for LGCT Ranking supremacy and consistency across the season is key. The Tour welcomes back an electric mix of show jumping stars, with some of the most respected names in the sport hitting the fast-paced city. 2017 LGCT Grand Prix of Shanghai winner Lorenzo de Luca (ITA) will return for a second bite of the apple, as will top French rider Simon Delestre (FRA) who has a history of success in Shanghai. John Whitaker (GBR) will return to the Championship, alongside multiple Olympian Ludger Beerbaum (GER) – who makes his return to the CSI5* show jumping scene following time out from an injury last year. Jur Vrieling (NED), Michael Whitaker (GBR), Daniel Deusser (GER), Christian Ahlmann (GER), Alberto Zorzi (ITA), Ben Maher (GBR), Gregory Wathelet (BEL), Pius Schwizer (SUI), Marlon Zanotelli (BRA), Roger-Yves Bost (FRA) and Maikel van der Vleuten (NED) are just a few of the names in action from 20th – 22nd April. Shanghai will also provide a platform for many of the world’s rising stars to shine. Fresh from her GCL Miami Beach win, U25 rider Anna Kellnerova (CZE) will head to China, alongside Constant van Paesschen (BEL), Emily Moffitt (GBR), Jos Verlooy (BEL), Alexandra Thornton (GBR) and Philip Houston (GER) – all of whom are making waves on the show jumping scene. Synonymous with glamour and new beginnings, Shanghai is renowned for its record-breaking skyscrapers which have sprung up where just twenty years ago there was only farmland, and the growing number of new show jumping fans in the region is developing just as fast. Since LGCT launched its first event in China in 2014, after a unique and ground-breaking agreement to allow international sport horses to compete on the Chinese mainland for the first time ever with the creation of a special quarantine zone – the interest in equestrianism has grown considerably. The number of Equestrian Clubs has increased from 200 to over 1,500 and continues to grow with club membership around the 1m mark (this was an increase of over 60% from 2016-2017). The number of registered riders is increasing, particularly among the youth, prompting a focus in the country on the development of young athletes in the sport with an eye on future world championships and Olympic Games​. The audience at the Shanghai LGCT also continues to grow with over 26,000 spectators attending last year. The event creates a bigger buzz in the city each year, attracting passionate equestrian fans and also a fashion-conscious audience and celebrities including Longines Brand Ambassador Aaron Kwok, Chi Ling Lin and Eddie Peng. Who will join Brash and Tops-Alexander and earn a golden ticket to the Longines Global Champions Super Grand Prix at the GC Prague Play Offs this December? While it’s uncertain who will rise to the top in China, this weekend promises a hair-raising spectacle of top sport. All the action will be streamed via GC TV, featuring analysis, expert commentary and exclusive rider interviews. For the run down of the show schedule, please click here.